I found a huge caterpillar in my cabbage the other day. After getting over the screaming fit that proceeded, I couldn’t stop smiling. First, I need to exlain the screaming fit because I can hear everyone (and my mum) reminding me that I was brought up in Africa and lived on everything that squirmed. I rememeber picking termites off a tree when I was 12 to eat for energy before running 5km BAREFOOT. I was a real African child. Anyway, I was once standing behind the bar at a party in the middle-of-nowhere town that I lived in and I felt something climbing up my leg, tickling me as it went. I was 16 years old and, with all the hormonally intoxicated 16 year old boys running around at the time, didn’t think anything of it. Someone may have had one too many smirnoff ices. Whatever it was kept moving up my leg and I looked down, only to see the biggest centipede ever! I screamed and jumped, and it jumped. We both landed back on the ground and it ran away. I am still scarred from this event (it probably is too). 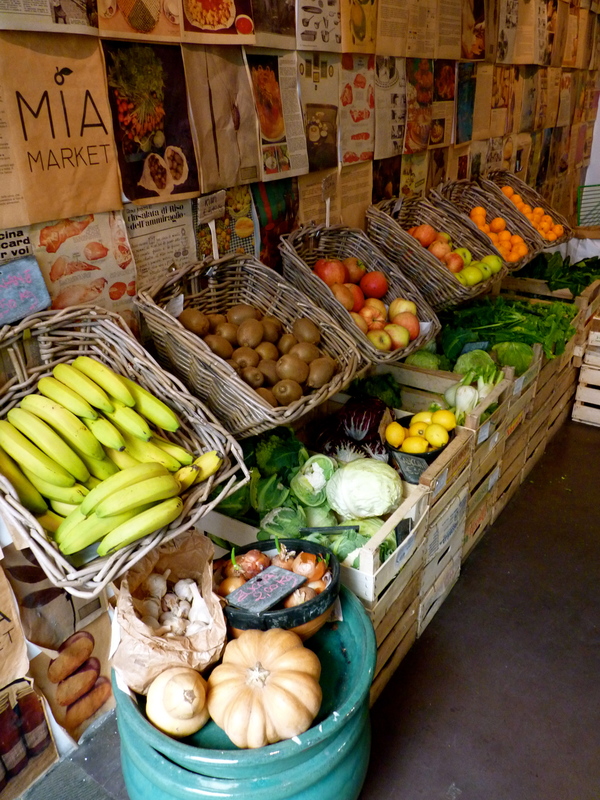 Now, the reason I smiled was because, after living in London for 10 years and not being able to buy fresh fruit and veg ( Yes, I mean fresh, because Tesco apples that remain unripe for 3 weeks and never go off don’t count), I have finally found a great bio market down my road. 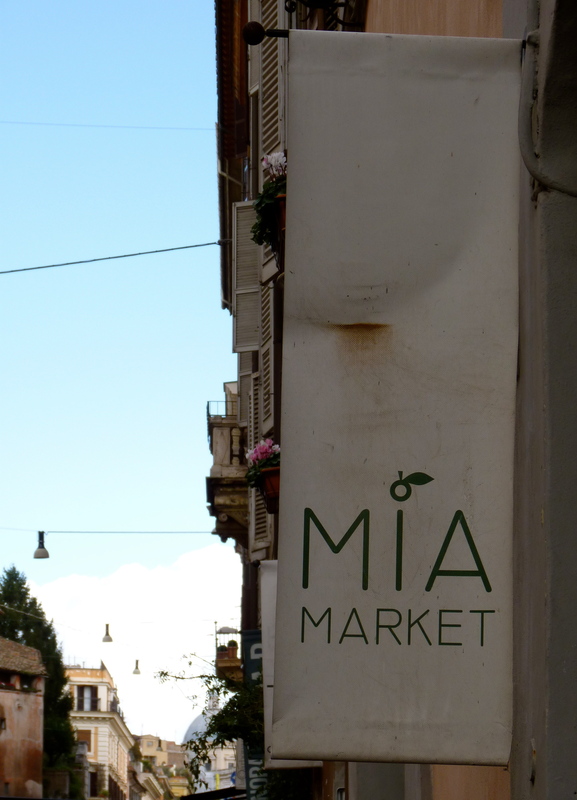 Mia Market sells seasonal, organic and local produce that is fresh and tasty (and they contain bugs- the nice kind- which means that there have been no harmful chemicals sprayed on them). 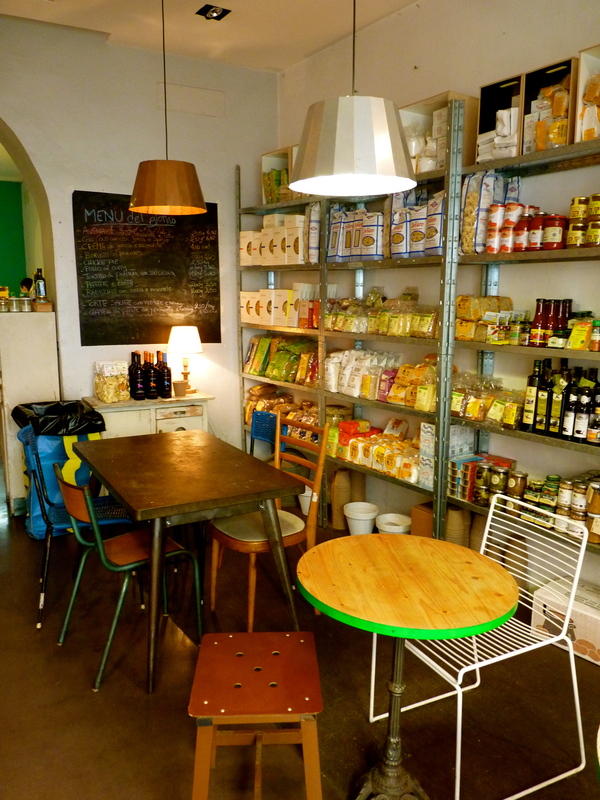 The shop is also a little cafe and offers lovely, healthy lunches and snacks, offering all that stuff that everyone tells you to eat, but you never have time to cook. You just choose what you want, they weigh it and warm it for you. Along with other organic produce (including wine), Mia Market also has fresh cakes, tarts and quiches, as well as lovely eggs from happy chickens. It is also a great place to relax and have an organic cup of tea if you’re in the area (and want to feel like a happy chicken). Well, we’ve moved neighbourhoods and we now find overselves residing in the ‘hip’ side of town (apparently). In Monti- translates as mountains. Formerly known as the ancient city’s brothel area, and it seems things haven’t changed in that department. The local eastern european working girls sit on their scooters on the side of the main road and it is only at second glance you realise that they aren’t waiting for their nonna’s in the hairdresser opposite. I’ve been told their mother started the family business and it has been passed down (as any traditional trade is in Italy) to her daughters, who stand around with their faces caked in makeup and negotiating prices with passersby. Around the time when we had just moved and had no internet (for two months- that’s Italia!) I would pass one of the girls every morning on my way to the internet cafe. I hadn’t realised who, or should I say what, she was yet, as she’d sit on her scooter most of the time and I had imagined she was waiting for someone she knew. Plus, even if I had known, a girl’s gotta do what a girl’s gotta (you get the point)….. Anyway, she had one a lovely pair of flat leather boots, so I walked over to her and asked her where she’d bought them. To say she nearly fell off her bike was an understatement! Obviously, she wasn’t used to getting friendly with the neighbours. Either that or she thought I was taking the piss. When she realised I wasn’t, she gave me the directions. After our little encounter, I assumed I must have broken the ice and considering we are sharing the same neighbourhood, albeit in a diifferent manner, I thought we’d be aquinated. Plus, I’m all for girl power and probably hate men as much as she does, so the next time I walked passed her I said ‘Ciao, come stai?’. She looked at me with an icy face as if I were last piece of proscuitto on the aperitvo plate and said: ‘Lascami stare!’ (Leave me alone). It was near the first anniversary of my move to Rome and I was being accused of harrassing (mental picture of myself as a rampant Italian teenage boy) the local brass flute (cockney rhyming slang)! Let’s not even mention the fact that she’s made her ‘office’ my doorstep, and I never had any say in the matter. So how did I respond? Well, I laughed and remembered what I have learnt living in this country (and how you can only respond to its craziness with three words before you carry on as ‘normal’). 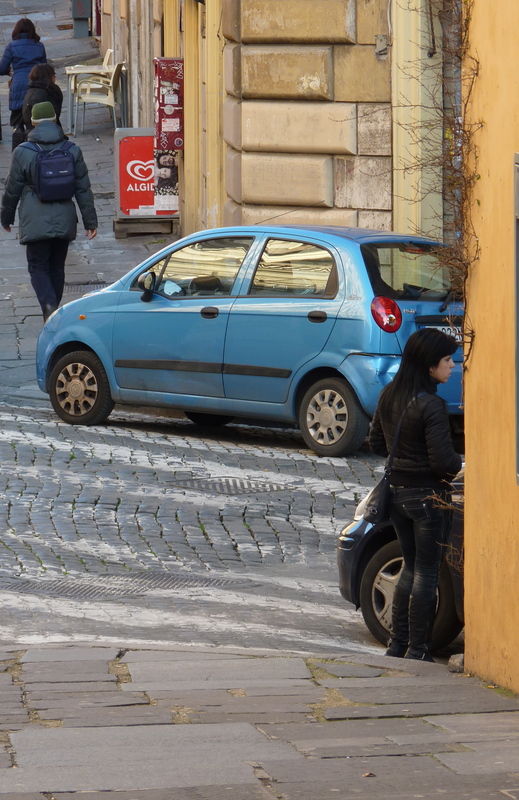 As the old expat motto goes: …Only in Italy!